CreatureCantina.com: The Most Comprehensive Khetanna Review CONTINUED! Let’s talk scale, because there are some incorrect claims whizzing about that need to be set right. I’ve done some research and some calculations (first with a calculator, then later refined with an online Imperial-to-Metric converter), and no matter what some people are saying online, HasLab’s Sail Barge is not to scale. Bear in mind, these calculations of mine are probably a hair off, but close enough for the needs of this discussion. The HasLab Khetanna is 49.35 inches long, or a smidge more than four feet, one-and-a-third inches long. If you insist on using the metric system, that’s near enough 1.253 meters, or 1,253 mm in length. The so-called “official canon” keeps listing the length of the sail barge at a nice round 30 meters exactly, which is 97 feet, 5 inches long. At 1/18 scale, the scale of the 3.75” figures, that measurement would put a toy sail barge at (as near as damn-it) 65 inches, which is 5 feet, 5 inches, nearly one and a third feet longer than the HasLab sail barge we got. This equates to 1.651 meters, or 1,651 mm long. Now, don’t get me wrong. I’m not complaining about the size of the Khetanna we got. Not by a long shot. It’s a staggering, wondrous thing to behold. All I’m saying is that it’s not in accurate scale, no matter what anyone else online might claim. But if it were made to proper scale, at just over 7.75 feet long, imagine how much more cripplingly expensive and impossible to display it might’ve turned out. Think how many more marriages it might’ve ended. No, I think what we got in terms of size is juuuuuust right. It’s mentioned in the instruction manual that the best way to put the removable side-panels back on is to start at the stern of the ship and work your way forward. (This is indeed a handy tip.) Presumably, this means the best way to take them off is to start at the bow and work your way aft. Personally, I find it easier to start in the middle and work outwards. If you want to display your Khetanna, it is probably best to get a table, shelf, or platform that is considerably longer and wider than the toy itself, to minimise the chance of bumping against it or knocking it off (and also leave some space for displaying a couple of skiffs alongside it). But, if you’re putting it on a high shelf out of the way of traffic, you only really need a shelf a little more than 22 inches long to give enough room for all four support legs. If you want to take your sail rigging apart to repack your Khetanna for storage and / or moving, you have to be very, very, very careful. Once you pry the very ends of the V-spars section out of the top of the main longitudinal spar, it would be best to slide a screwdriver into the gap, move it towards the center of the array, and very, very slowly and carefully pry upwards once you get to the next peg-and-hole fixture. Eventually, you can pry upwards at the square clip in the middle, and the rigging will come free. I’m guessing this was done to ensure everything stayed nice and sturdy once assembled, but it’s absolutely nerve-wracking to take apart. I don’t know how many times this can be done without causing damage, but I’m not eager to find out. Well, now that you’ve had the grand tour of the sail barge, what’s the verdict? Well, I’m not going to lie to you, and I’d like to think that I’m not so dazzled by the thing that I can’t look at it objectively. Is the HasLab Khetanna an amazing and detailed work of art, craft, and engineering all rolled into one? Oh, yes. Is it bound to be one of the crown jewels of any Star Wars collection it graces? Undoubtedly. Is it huge and impressive? You bet. Will it look phenomenal on display? Certainly. But is it worth it? I can’t answer that for you. Only you can answer that for yourself. If you’re flush with money, and your significant other is fine with it, knock yourself out. If you want to own a piece of toy-making history, it’s worth it. If you want a really awesome — and I do very literally mean really awe-inspiring — Star Wars collection, it’s well worth it. BUT . . . If you’re struggling to scrape together enough money to get insulin for your twelve kids, no, it isn’t worth it. If it’ll cause a rift in your marriage, it definitely isn’t worth it. If you’re expecting perfection or anything more than what I’ve laid out for you here, it’s not worth it. The Khetanna is an amazing piece, and I feel intensely privileged to have gotten a sample to review. Just the sight of the box alone made my heart sing, let alone seeing the fully-assembled barge itself. But I just can’t describe this as the best Star Wars toy ever made. I really don’t want to sound like an ingrate, but the fragility, the manufacturing flaws and inconsistencies, and the lack of adequate bang for your buck brought it down in my estimation. 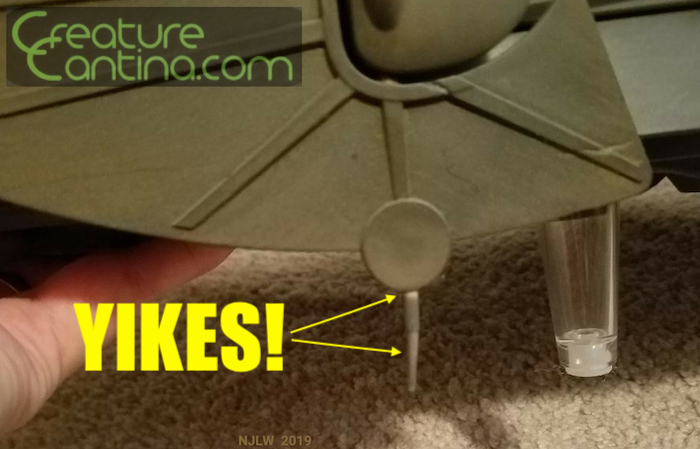 By comparison, the justifiably-famous BMF (Big Millennium Falcon) from 2008 was just under three feet long, was pretty dang sturdy, and was chock-full of action features, lights, sounds, dialogue clips, and firing missiles — and sold for around $150. Later, when the same Falcon was re-released as a Toys ‘R’ Us exclusive in 2012, the price jumped to $250, but it still had all the same action and electronic features as its 2008 release, only packed into in a Vintage-style box. And I made no secret of the fact that I considered the $300 AT-ACT from Rogue One (even with all its interactivity and features) to be overpriced, considering its small size. But the Khetanna? It’s twice the jacked-up TRU Falcon price, has no lights, sounds, dialogue clips, music clips, or firing missiles, and it’s only about a foot and a half longer than the BMF. The Vintage Collection Jabba’s Sail Barge is stunningly huge and achingly beautiful and so vastly improbable that it even exists in the first place that I still can’t believe I can go over and look at it and pick it up and put action figures inside it, even though I’ve been doing exactly that for the last couple of weeks . . . but it just sits there, being fragile and breathtakingly expensive. And that’s just with the direct-order price (with tax) of $535, let alone the insane prices that are getting racked up on evilBay and other scalper-friendly sites. Okay, it’s a prestige piece. I get that. You’re paying for bragging rights of having one of the rarest, biggest, most intricate Star Wars sets ever produced, custom-made to order and delivered right to your door. Cost of raw materials going up, inflation, wages for all the hours worked by dedicated teams of talented employees, tooling, research, manufacturing, transportation, logistics, publishing . . . yeah, it all adds up. I get all that, too. And I know Hasbro didn’t promise anything they didn’t deliver upon, nor did I take any of the wild fan speculation as given features on the final product; Hasbro gave us exactly what they said they would. So, yeah, I get that, too. But for $500 (tax not included), I don’t think it’s exactly unreasonable to have wanted a little more from it. I really do love this thing and think it’s amazing. I just wish it could’ve been a little better, is all. FINAL SCORE: Setting the letdowns against the price tag versus overall awesomeness, I have to give it an A-. But that’s just my opinion. If you disagree with me, that’s okay, too. But however you feel about the Khetanna, nothing can change the fact that it's a remarkable piece, a truly exceptional collectible, and the biggest Star Wars toy yet made. Stunning.